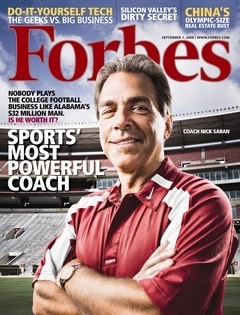 Reports from Tuscaloosa are that head football coach, Nick Saban has agreed to a multi year extension. While contract specifics have not been released, word on the streets is that it’s worth between 7 and 7.5 million a season. This kills the hype and rumors of Saban taking his talents to Texas. I personally am disappointed on multiple levels. First, I am just sick of Alabama. That’s all I have to say on that one… Nothing to elaborate, I’m just over them. Second, I think it’s amazing that Saban has lead 2 different programs to a national title, 1 with LSU and 3 with Alabama. It would have been insane if he could have turned the Longhorns into a champion and powerhouse from outside of the SEC. But it appears now we will just have to endure the Rolling Tides a little longer.